At a lot of schools, the first quarter has been coming to an end, and parent-teacher conference season is happening. Sometimes parents struggle to come up with a list of questions to ask their child’s math teacher. Now that I’m on the parent side of things, I have to go through this exercise as well. 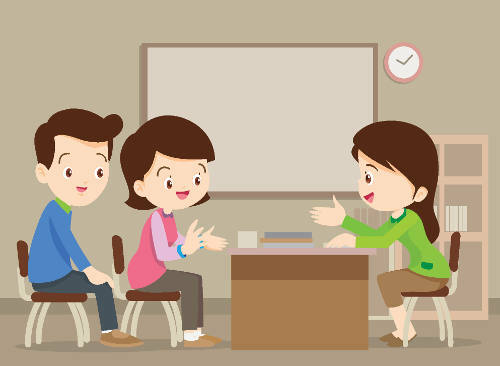 As a teacher, parent-teacher conferences ranged from the very mundane to an intensely emotional, personal experience. Typically, the parents of kids that were struggling were at wits-end about how to help them, while parents of successful children were all smiles and just wanted to chat a bit about college and future coursework. The list that follows is very high school driven. Many of these are questions parents did ask me over the years, while others are questions I wish they had asked. In any case, I hope you will find something that helps you here during your next interaction between parent and math teacher. Is my child giving his/her best effort? Does my child come prepared to class on a regular basis? Does my child volunteer to answer questions? Does my child ask questions when he/she doesn’t understand? Does my child do better on homework assignments or on quizzes and tests? Does my child do better on problems involving more concrete tasks involving numbers or more abstract mathematical concepts? Do you think my child knows how to prepare for your quizzes and tests? What are some ways I can better prepare my child at home? Is my child taking advantage of class time to get help from you? Is there a time you are available for extra help before or after school? Does the school offer a peer tutoring program for math? Are there concepts that my child may have missed out on from earlier this year that he/she needs to go back and review in order to succeed on the material for the rest of this year? Is my child using their success to benefit other students in the class through positive group interactions? What concepts and topics are still to be covered this year that might still be challenging for my child? Are there opportunities for extracurricular STEM activities at school that might be a good fit for my child? What future AP classes in mathematics, science, and computer science should my child be considering? What should my child be doing to prepare for the mathematics component of the ACT or SAT? What should my child be doing to prepare for the AP test? How well is my child prepared for college mathematics and STEM courses? Where does this course fit into the sequence of mathematics courses at this school? What is the best way to reach you if I have a concern? What can I do to better support you? Is my child treating the other kids on the class with respect? Is my child treating you as the teacher with respect? Do you have any good questions I should have included? Please add them in the comments below. Infographic: Does Teacher Pay Affect Student Peformance?